Message #1: They express to Kanon that they think everything about her radio show is a lot of fun and enjoy that she gets very bright when talking about food. Because of that, they wonder what she likes in her nabe. Kanon answers that usually her father will make nabe and that she think it is very good. Theres tons of stuff in it like crab, cod, salmon, along with lots of vegetables. She explains that her father is a cook and although she can’t remember what he puts in it for the stock, the flavor of the nabe itself of a special quality. Besides her fathers, which is her favorite, she also likes Motsunabe, but overall she prefers her fathers and proclaims that she wants to eat it a lot in the winter. Message #2: They ask Kanon if she has any mythological creatures that she likes. They say they like a certain one, but Kanon has never heard of it (Turns out it was this). Kanon thinks for a bit, then answer that she likes cucumbers and the color green, so probably Kappa. But to be honest, she hasn’t really read much on mythological creatures like kitsune, tanuki or ghosts, so she doesn’t know much about them. Kanon announces that they sent the question on a postcard from Inazawa, Aichi, so she collects the postmark and puts it on her map. Message #3: This listener comments about it being the end of the year and needing to start cleaning their house. They ask if Kanon is good at cleaning and if she has an tips and tricks to share. She reveals that her room isn’t particularly clean and she tends to leave things scattered around. For motivation however, one time she took a “Before” picture of her room before the other 9th generation members came over to visit. Kanon explains that because it is more satisfying to have an “After” photo she will clean her room to the fullest and then take that photo to see the transformation. She also mentions that she likes being on cleaning duty for her school, mentioning that being alone and making sure the desks and blackboard are clean is fun for her. Message #4: This fan just have a short question: what costumes did she like wearing with everyone. Kanon mentions she really like wearing animal costumes. Apparently, at a fan club event her manager let her wear a cow costume. She moves on to talking about the pyocopyoco ultra’s chicken costumes. She explains everyone’s differences in the costuming; Niigaki, being the oldest, dressed up as a chick but with a big feathered head, Aika, Reina and Sayumi had ribbons on their hats, and the 9th gen had like “egg colored” costumes. She gushes about how cute she thought they were and how much fun she had wearing them. At the end she mentions also enjoying one two three’s costumes where each member represented their color, so she got to show off her green. Kanon can’t play the piano very well but wants to become better, so the staff suggested she starts practicing as a radio segment. The first song she announces she is going to try playing is Pachelbel’s Canon in D. Its a very commonly known song from the baroque period, Kanon says. Apparently, her mother would play it often on their home piano and she would observe, but thinks the song will be difficult to play anyway. When she was in elementary school her mom would sometimes give her piano lessons, but after she joined Morning Musume she stopped learning. From there she quickly explains how a canon works (see link above). She then attempts to play it on the keyboard. Click here to hear her attempt! After that she professes that its really too hard for her to do it. Even though she has practiced at her house a few years ago she doesn’t think she can do it now. She does claim, however that maybe a reward would entice her. 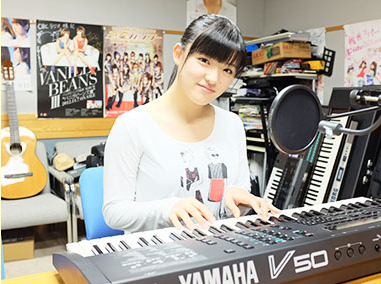 The staff agree and say that she will get one, to which Kanon says “Oh, well if I play the piano well once a month and get a reward, then its ok.” They ask her what kind of reward she wants. She thinks for a bit, then answers that she wants to be rewarded with Karaage hearts. This makes her excited so she says she’ll do her best to successfully play a song and hopes people will listen to her get better at the piano. As for the last song, it comes as a request from a listener as it was the audition song for Kanon, and it fits the week this aired, the week of Christmas. Kanon gives her regular announcements about the upcoming concerts and events, but there seems to be time for one more listeners message. This message is from someone asking Kanon about colds and what she does to prevent or treat them. Kanon claims that she doesn’t get colds very often. It may be due to the fact that she tries to eat balanced healthy meals. Therefore, her only recommendation is to eat properly. That piano part! Hahahaha! Maybe her recovery will give her time to practice a little more. I really want to hear her play a song. She is right on about not getting colds though – eating properly and eating habits are all key to a healthier body!